From its history Europe has drawn the conclusion to build a common house for its states and cultures – economically in a common economic area, politically and legally through the formation of a union of states, culturally in jointly communicated values, and last but not least through the common currency of the Euro. How do we want to shape our communities in the 21st century? What are the drafts for a European democracy? What is the role of education, science and the arts? What can a sustainable and social way of economy and money look like? These should be our lead questions! – We want to sound them out and ask about the consequences all of this has for the diverse areas of European citizens’ life. We want to find answers to Europe’s challenges in a globalized world in which social security is increasingly threatened and our livelihoods are in danger, in which we have to deal responsibly with nature and in which global solidarity is needed. Dome Talk in Rome, where many approaches to Europe can already be found in ancient times and where with the Treaty of Rome in 1957 one of the starting points of the EU was set. To this end, we want to start the conversation and make the results of these discussions available! We want to create a public space for Europe’s future issues. 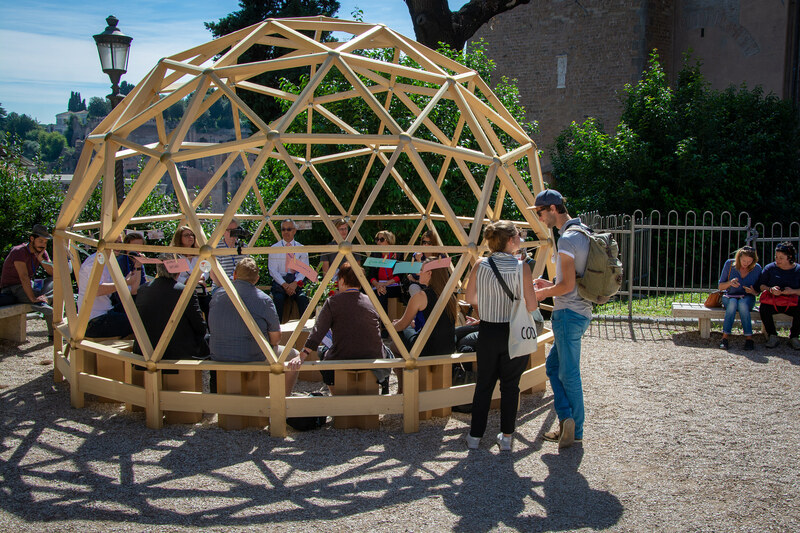 For these talks, we choose the public space and erect a geodesic dome – the Europe Dome. Under its roof, people who want to throw something into the scale pan for Europe come together. It must not be a gathering of organizations and institutions, but a gathering of people with thoughts and ideas! Ideas that already lead to concrete initiatives and actions and can be the building blocks for Europe’s social architecture. We took the initiative because we are convinced that we already have something to share under the dome. But we are also looking for all other people and their building blocks for Europe. We want to put the results we have achieved up for discussion and further develop them together.